Оn January 22, 2018, Russian President Vladimir Putin and Japanese Prime Minister Shinzo Abe will hold talks in Moscow. "There are plans for discussing the current condition of and prospects for developing bilateral cooperation in the political, trading, economic and humanitarian spheres," the Kremlin press-service said. After Vladimir Putin and Shinzo Abe agreed in November 2018 to speed up peace treaty negotiations, there was some movement in the parties’ positions. On the Japanese side, there was a substantial softening of its previously unchanged policy to “return” the four South Kuril Islands, indicating Japan’s intention to find a compromise to the ill-fated border issue. Many began to describe Tokyo’s stance as the “two plus alpha” formula, where “alpha” could be some economic privileges for the Japanese in the Russian South Kuril Islands, such as exclusive rights to conduct joint economic activity or visa-free visits, rather than transferring the two remaining islands, after handing over Habomai and Shikotan to Japan. Notably, the “illegal occupation” by the northern neighbor of “original Japanese territories” approach is completely missing from Tokyo’s official lexicon. The Japanese Prime Minister’s Special Advisor for Foreign Affairs Katsuyuki Kawai rushed over to Washington for consultations, where he met with high-ranking White House representatives and, apparently, encountered no objections from the American side. Abe himself, in his public statements, began to present the Japanese vision of the substance of the issue, proposing the parties’ mutual refusal of any compensation and noting the need to obtain “consent” from the residents of the islands being transferred to Japan. These revelations by the Japanese prime minister, which were not coordinated with the Russian side and therefore violated the principle of confidentiality, caused discontent in Moscow. The Japanese ambassador was even summoned to the Russian Foreign Ministry to hear an official protest. However, the fact remains: judging by Japan’s current rhetoric on the planned peace treaty with Russia full of specific details of the deal, Japan is in a high degree of readiness to sign a peace treaty based on the 1956 Declaration. The situation looks different from Moscow’s perspective. Statements by Russian officials are dominated by cautious and expectant rhetoric and include warnings against rushing the process. While government representatives generally prefer avoiding the issue of border demarcation, all sorts of politicians, both from parliamentary parties and non-parliamentary opposition, show unprecedented unanimity on this matter, and are determined not to concede “an inch of native land.” Indicatively, on January 10, LDPR representative submitted a draft law to the State Duma that would qualify any border demarcation options involving the transfer of any territories to Japan as illegal. Russian Foreign Minister Sergei Lavrov declared that Japan must first recognize the outcome of World War II, the obvious implication being the recognition of the legitimacy of the annexation of the Kuril Islands by the Soviet Union in 1945. What is the reason for this demand and is there any chance it will be met? Japan clearly sees the Kuril Islands, as well as South Sakhalin, as territories with uncertain legal status and therefore shows them on their maps in white. Tokyo’s position is that the territories that Japan owned before the war cannot be recognized as Russia’s until a border agreement is signed with it. In practical terms, this does not mean that Japan has any claims on the Kuriles (with the exception of the four southern islands) or South Sakhalin: otherwise, the situation where a Japanese Consulate General has been lawfully operating in Yuzhno-Sakhalinsk for many years would be seen as absurd. ﻿At the plenary session of the Eastern Economic Forum Vladimir Putin offered to Japanese Prime Minister Shinzo Abe to conclude a peace treaty "without preconditions" before the end of the year. This proposal seemed to look spontaneous, and so far no official answer came from the Japanese side. Nikolay Murashkin, Visiting Fellow at the Institute of Asia of the Griffith University (Australia), spoke in an interview with www.valdaiclub.com about the likelihood of the treaty signing, possible obstacles and consequences of this historic step for Northeast Asia. It is more important that Moscow is demanding that Tokyo recognize the legitimacy of Russian sovereignty over the notorious “northern territories” - the four South Kuril Islands. From Russia’s perspective, if the parties, pursuant to Article 9 of the 1956 Joint Declaration, agree to transfer Habomai and Shikotan to Japan, Japan should realize that Russia can only fulfill this requirement if it owns the islands legally and acts out of free will, as stated in the declaration. However, in Japan’s view, since the four islands were assigned to Japan under the first Russian-Japanese treaty of 1855, they have a different political status than the other Kuriles, and therefore do not fit into the concept of the Kuril Islands which Japan gave up under Article 2 (c) of the 1951 San Francisco Peace Treaty. This position was referred to, in particular, by Japanese Prime Minister Hayato Ikeda, who said at the budget commission of the lower house of parliament on October 3, 1961, that Japan officially includes only the Urup Island and the farther northern islands of the Kuril Ridge in the concept of the Kuril Islands. In this sense, it appears difficult for Japan to recognize Russia’s demand in the section concerning the “northern territories” because this would make its territorial claims pointless: how can anyone require their partner to return what legally belongs to them already? As for the other outcomes of World War II, the parties have no disagreements: any mutual claims were removed by the 1956 Declaration. All this considered, prospects for implementing the part of the declaration on the border demarcation are unpredictable. The situation is also complicated by the lack of consensus on two points. The first stumbling block is the non-deployment of US military bases on the islands if they are transferred to Japan. Bearing in mind that Tokyo’s refusal to give any non-deployment guarantees in November 2016 caused a hitch in negotiations, Shinzo Abe assured that Japan would not allow the US military on the islands. US General Jerry Martinez has confirmed that the US has no plans to establish a military presence on the islands. Nevertheless, there is still a strong opinion in Moscow that Japan, with its strong foreign policy and military dependence on the United States, cannot be fully trusted. Tokyo’s inability to provide full non-deployment guarantees becomes an additional negotiating argument for Moscow to justify its uncompromising attitude toward handing over the islands. The second issue is the actual transfer of the islands. In December 2016, Vladimir Putin said the declaration does not specify whether the transfer of the islands to Japan implies the transfer of sovereignty. However, it must be realized that Japan would most likely see a transfer that excludes Russia’s releasing sovereignty over the islands as grounds to suspend the negotiations, which would inevitably lead to a breakdown. 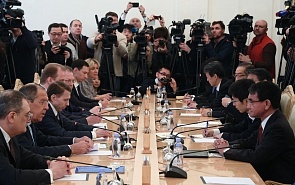 Theoretically, Moscow could try to drag out the negotiations so as to evade fulfilling its obligations under Article 9, putting forward unacceptable conditions for Japan – for example, withdrawal of all US military bases from Japan (a similar requirement, made in a statement by the Soviet government in January 1960, froze Russian-Japanese political relations for decades) or the recognition of Russian sovereignty over Crimea. However, it should be understood that such demands would quickly lead to the breakdown of negotiations and return our relations to a Cold War state. Under the current conditions, Moscow’s non-recognition of the 1956 Declaration’s efficacy appears unproductive. The process of developing a compromise based on this document has gone far enough into a dead end in the public field. Moreover, during Vladimir Putin’s presidency, Russia has always recognized its international legal obligations under this document, and a unilateral withdrawal, whatever the rationale, would strongly affect the prestige of Russia and the Russian President. It should be borne in mind that any Japanese Prime Minister after Abe would not remain just neutral, but actually hostile towards Russia after that. Russia’s unilateral refusal to comply with the 1956 Declaration would go down in Japanese history textbooks as a hostile step of the same kind as the breakdown of the neutrality pact in 1945 and the retention of 600,000 Japanese prisoners of war in Soviet captivity. It is true that Moscow could simply ignore this fact: Japan is not its main economic partner; it supports anti-Russia sanctions and in any case would not change its foreign policy orientation towards America. It is also clear that a settlement of the border issue will not cause a windfall of Japanese investment, so the “island in exchange for investment” formula would definitely not work. Still, the move could have a negative consequence for Russia; that would be having a hostile state next door, while China would be the main beneficiary of a cooling in Russian-Japanese relations. Moscow’s diplomatic and economic dependence on Beijing would inevitably increase, and room for diplomatic maneuvering in Asia would be diminished. Strengthening the bloc confrontation in the security architecture of East Asia would lead to a new tightening of international tensions and an increased threat of armed conflict on our Far Eastern borders. Russia being part of an anti-Japanese coalition on China’s side would certainly not meet Russia’s national interests. At the same time, it would be good to remember that Beijing holds a frankly pro-Japanese position on the South Kuriles, recognizing them as Japanese territory including coloring them on their maps as Japanese. The signing of a peace treaty and the further transfer of the islands to Japan is undoubtedly an extremely painful step for Moscow, which definitely will not find much public support and will not add to the popularity of the Russian President. Yet, something else is perfectly clear: the full normalization of political relations with Japan would significantly enhance Russia’s security and the stability of its borders. By signing a peace treaty with Japan, Russia would put an end not just to a border dispute, but also to the history of World War II, ending the post-war settlement era. Furthermore, Russia would strengthen its international prestige as a country that unconditionally fulfills its international legal obligations. Undoubtedly, this would be a serious diplomatic step, its significance reaching far beyond the framework of bilateral relations with Japan.